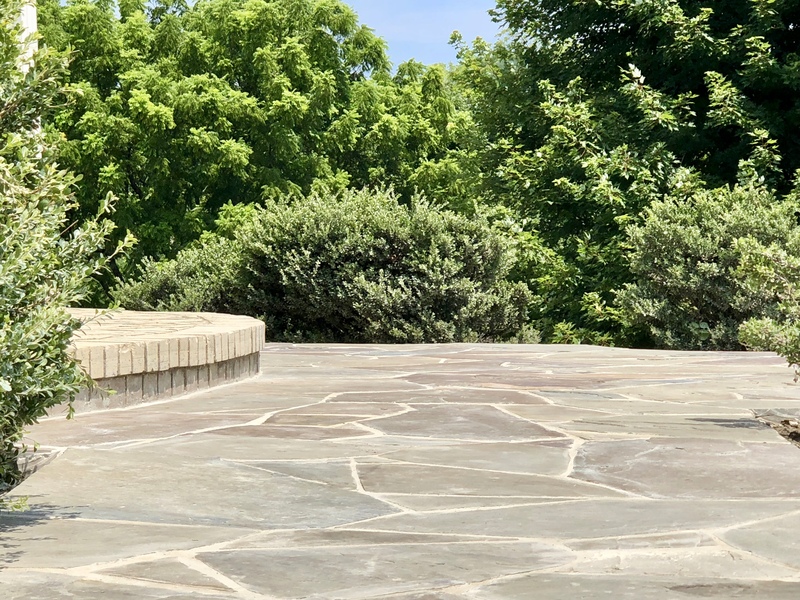 Flagstone walkways, steps, and patios need occasional maintenance and repair to renew the cracking mortar caused by repeated freezing and thawing. Once the mortar is cracked, moisture can seep in, and if not properly maintained, continued cracking will occur. If caught in time, repairing hairline cracks is not difficult. Unfortunately ours was neglected for years and needed more than a small repair. We needed a complete overhaul of our walkway, definitely a big job. After considering various options, we decided to restore the walkway. The process will entail removing all the flagstone and mortar, digging up the concrete, laying new concrete, and setting the flagstone in cement. As you can see in some areas of the walkway, the flagstone has completely separated from the mortar. The mortar has crumbled so badly, the stones are loose and no longer connected to the cement base. Some areas of the walkway are in fair condition but over time will separate too, if not repaired now. The process begins by removing the flagstones and the mortar. Obviously, not all the flagstone comes up easily and many pieces are breaking in the process. Notice how the stones are laid to rest in the flower beds? Good call on deciding to replace all the bushes after this project. Notice how the deer enjoy dining on the shrubs? The first layer of stone and cement has been removed. Time to bring out the jack hammer to dig up the second layer of concrete. The process is slow, the cement is thick and it’s really hot outside! Most of the concrete has been dug up and is now a huge pile of rubble. The flagstone is cleaned and laid back down in a time consuming process, many pieces need to be chiseled and recut. Working simultaneously, a new concrete base is mixed and applied to this area, while stones continue to be set on the front section of the walkway. Fresh cement is mixed and laid down under each stone. A fresh concrete base was laid but it was very hot today, looks like these guys left in a hurry! A couple new pallets of flagstone were brought in to replace old and broken pieces that can not be reused. The new pallet brings in a variety of color to the walkway. This large section near the front door is taking a long time to complete, almost a week. This looks like a big puzzle, putting together so many pieces. Important to have skilled professionals to do the job right. Glad I’m not doing it. The mortar is mixed and a small section is applied. Starting to look really good, almost complete. The area off the mudroom is taking shape and looking nice. The section off the front door is finally done. So happy to have this project done. Next up, all new landscaping! Stay tuned! The entire restoration process took 4 weeks to complete. We are happy with the results and believe we made the right decision to restore and reuse. We need to allow the mortar to dry for at least a week, then the crew will come back to acid wash and seal the stone. They will also smooth out the sides of the walkway a bit more, giving them a crisper edge. Have you had any major hardscape repair work done to your home? Oh no, sorry to hear that. Maybe you can find a more cost effective alternative like pavers? Every month you guys are taking on new projects. Whew! I would be so overwhelmed haha. I love the new colors too by the way. I am a bit overwhelmed at the moment and the kids are home for the summer….not helping!!! UGH! Oh good! Make sure to get several quotes…prices do vary quite a bit! Hope it all works out!! Thank you so much Betsy!